Hobby RC cars are way more fun than toy grade ones. They are faster, have more features, and are more customizable. In the $100 – $200 price range, you start seeing more RC cars that are hobby grade, and less that are toy grade. Hobby grade remote control vehicles are made by reputable manufacturers, and are built to last. They are used for racing, off-roading, and general driving. Unfortunately, hobby grade vehicles cost significantly more than their toy grade counterparts. This is due to higher quality materials, more complicated engineering, and larger size. There are thousands of different options. On top of this, some hobby grade RC cars can cost as much as $1,000 or more, which may be out of your price range. Under $200 is a great place for someone to start who has interest in driving hobby grade cars, but isn’t that experienced. We put together a list of the best remote control cars for less than $200, so you don’t have to worry about doing the research yourself. 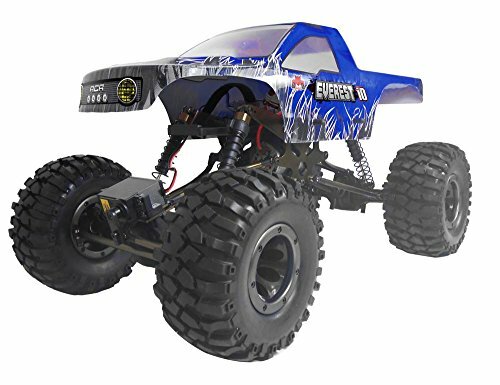 best RC car under $200 is the Redcat Racing Everest-10. This car is one of the all-time best rated remote control cars, regardless of price range. 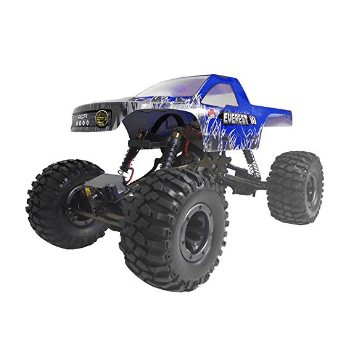 Its great rock crawling ability, durable construction, and great price were the some of the reasons why we chose this RC truck to top our list. You can tell from this trucks name that it was meant for rock crawling and scaling mountains. The Everest-10 is a 1/10 scale, 4×4 platform, which means it is a great size and layout for rock crawling. It has knobby tires for extra grip, real shocks filled with oil, and ball bearings, making it one high quality build. Just because it is a rock crawler, doesn’t mean that it isn’t fun to use on flat terrain. All of the incredible features that help it handle well on rocks makes it more fun to drift around with. The Everest-10 is powered by an electric brushed motor, with four-wheel drive, creating a high-torque vehicle. The 7.2V 2000mAh battery also provides a nice kick of power for this truck. Even though this is one of the lowest priced. Rock crawlers on the market, it is arguably the best. If you have an itch to go conquer some rough terrain, or like to go mudding, this is the RC for you. 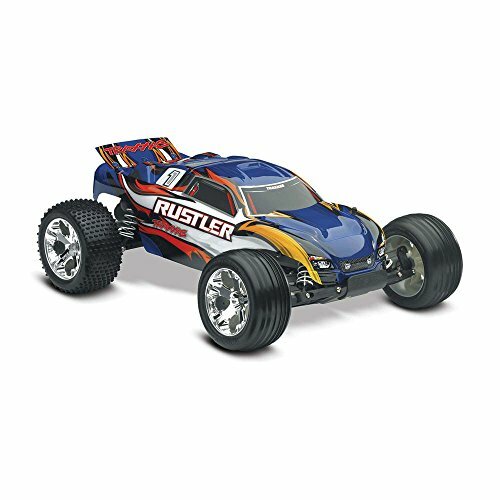 The second best remote control car for less than 200 dollars is the Traxxas RTR 1/10 Rustler. Traxxas has long been one of the best RC manufacturers, and this car really shows their ability to make a quality car. 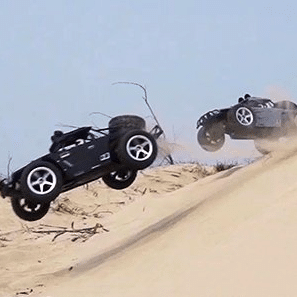 If the Everest-10 was all about rock crawling, this RC is all about speed. 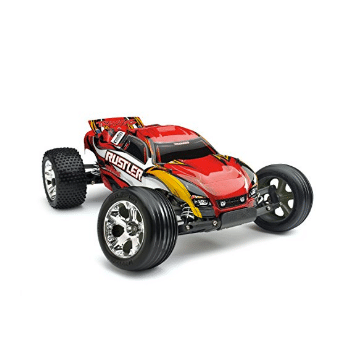 The Traxxas RTR Rustler can hit speeds of up to 35 mph, which is quite impressive for cars in this price range. The motor behind this incredible speed is a Titan 12-turn 550, that utilizes an XL-5 electronic speed control. In addition to an almost over-powered motor, this car sports a 7-cell NiMH battery, for long lasting speed and power. Also standard on this model is the Revo-Spec Torque control slip clutch, grippy tires, and a steel differential. Like most other Traxxas vehicles, the RTR Rustler offers all waterproof electronics, making it the perfect vehicle for water, mud, wet grass. Another nice feature that the manufacturers included with this model is the fast charger, which brings the battery up to full charge up to ten times as fast as traditional chargers. This minimizes waiting time, and maximizes drive time. For this price range, you will not find an RC car with better specs. It truly is an unbelievable deal for this fun of a product. 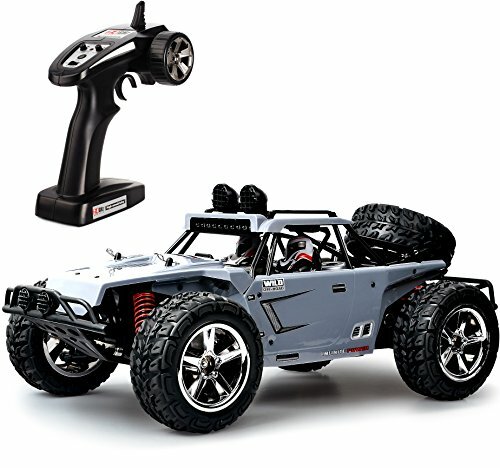 The third RC car for under $200 is the TOZO C5031 Warhammer. This RC car is among the best in terms of speed and offroading capability. It is also among the lowest priced of all hobby grade RCs. If the Everest-10 was all about off-roading, and the RTR Rustler was all about speed, this car comes somewhere in the middle of the two. The car is incredibly fast for an off-road capable car, able to reach speeds of 30 MPH. But just because its fast does not mean it lacks in the off-roading department. The 4×4 drivetrain, impressive suspension, and low gearing all make this car ready for the gnarliest of off-roading. The Warhammer is also an incredibly durable vehicle. It is made of all-metal construction, has an independent shock-proof system, and has rubber tires. This car comes with LED lights for great night-time driving. The battery is a 7.4V 1500mAh, which is rated for about 20 minutes of drive time, and recharges quickly at about 3 hours. 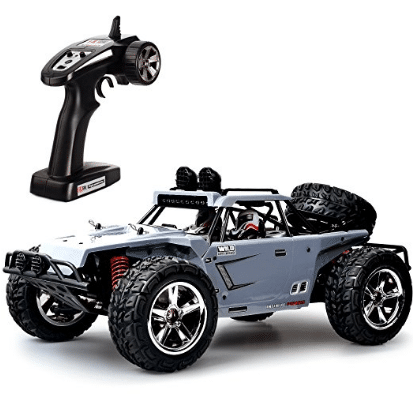 If you are looking for a great RC car that is capable of hitting high speeds, but will also be able to conquer rough terrain, the TOZO c5031 Warhammer is the best choice on the market. But the fact that it is lowest price in this review makes it even better. 1 / 12 full proportional off - road vehicle, Powerful motor, maximum speed is up to 30 km/h+. Remote Control Car with white and red LED lights, makes you feel Cospla at night. High speed Warhammer truck makes you experience the thrill of speed . Anti-interference, several RC car competitive at the same time and place. 20 mins playing time, 3 hours full charging, 2.4Ghz Radio System and over 50M Remote Control interference-free distance allow you achieve pretty high-speed off road and drift. Rubber wheels prevent slippery Realistic car design, fashion and cool; Adopt three stage differential gear with the most complex technology in high speed auto industry. Please note: Minimum use age recommended is 12 year old. The is a high speed rc car. Please avoid hit object when it's in high speed running. It need to stop accelerating immediately while the RC car is stuck which can not go forward, otherwise the motor would be damaged by overheats and smoke . All parts has part number from the manual book, and all parts can be purchased separately on Amazon . It's easy to upgrade and repair. 1. Know what you want out of the vehicle. In the world of remote controls, not only are there many different types of vehicles, there are many sub-types as well. When looking at cars, there are race cars meant for speed, buggys, trucks, and hybrids. All of which have different strengths and weaknesses. Find out what type of driving you are interested in doing before you hunt for a vehicle. 2. Get familiar with how RC cars operate. Even though they may seem simple, RC cars are almost as complicated as full-sized cars. They have to pack the same basic systems in a smaller package. This means many small parts, with specialized roles and features. Get to know what all of the basic systems do. In addition to this, find out what the different specs mean. For example, batteries have a bunch of numbers on them, all signifying different specs. 3. Search for the best deal. There are many different sellers of RC products. The same models can be sold by dozens of different distributors, in addition to local shops. searching around at a few different places can save you ten percent or more on a single model. If you are unsure of where to purchase, we always include a link to the lowest price we find for each product. If you are searching for a different RC, be sure to check out our other detailed reviews.